Below you will find a list of all the Pinnacle Sports Book bonuses - offered to new players. The right side offers a casino overview (click to scroll through the images). Pinnacle Sports was launched back in 1998 and is a well-known sports betting site for Canadian players. It is licensed in the Netherlands Antilles, Curacao and offers great odds for all major sporting events including most American Sports. Pinnacle has one of the lowest margins in the industry giving bettors excellent value. They often offer the best betting lines and have an excellent reputation for their top class operation. There is no special welcome bonus available to new Canadian players at Pinnacle sports book. There are occasional promotions and bonuses offered once you sign up for an account though so be sure to keep an eye out for these and any bonus codes that you can use. We recommend checking out the Pinnacle Sports "Bet of the Day" promo that offers enhanced pricing on a different selected event each day as you can get great deals here with markets priced as low as 101%. If you prefer to place bets with your bookmaker using your mobile phone, you will be delighted to hear that Pinnacle have a dedicated mobile app called Pinnacle Lite which is available for iOS user with an Android app on the way. This mobile betting app allows you to quickly get the best bet available. You can see the recent odds changes and set up alerts for certain prices covering six different sports markets. The app is very user-friendly and allows users to place their bets on the go so they never miss out on the action. When it comes to in-play betting at Pinnacle we were a little disappointed. In-play bets are only offered for top leagues in football as well as for US sports types. 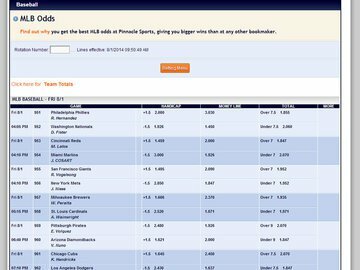 We are hoping that this bookmaker will see the value and necessity of catching up with other sports betting sites when it comes to the OpenOdds team. Even the most professional sports bettors want the option to have in-play bet experiences available to them every so often. As far as betting odds go, Pinnacle Sports betting odds really are remarkable. This bookmaker earns money with their sports betting offers but not at the cost of the betting odds. 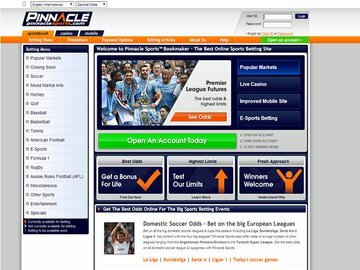 The betting odds that you will find on this site are almost as good as those of a betting exchange, but Pinnacle is still as strict as any other bookmaker on the market. In order to make their "lower margins through high volumes" model work, this sports betting site targets serious and successful players who bring in these high volumes via deposits and cashouts. This is an innovative approach that has proven to be very successful for them. Betting limits are also in place and this is a minimum bet limit of $1 per wager placed which means all bettors can take part even novices. They also have exceptionally high maximum bet limits which are set at $750,000 per bet. This will satisfy even all professional bettors although you would want to be very sure of winning to place such a large wager. In this section we were looking at user-friendliness and the ability to place bets with the same quality on a mobile device as you can on your desktop. The site is efficient and very user-friendly although some sections are a little out-dated and not as modern as we would have liked them to be. What we really love is the fact that they have a separate mobile optimized section for bettors visiting the website on their smartphones and tablets and it works really well. Everything is easy to find and after a couple of visits, you will know where everything is. Managing your account at Pinnacle bookmaker is easy. The site accepts 20 different currencies including Canadian dollars, Euro, Australian dollars, British pounds sterling, US dollars and a number of Asian currencies. There are plenty of deposit methods available too including bank wire, credit and debit cards, ClickandBuy, e-check, EntroPay, E-Payments, Instadebit, Neteller, Skrill, Ukash and more. The full list can be found on their website. When it comes to withdrawals, it is worth noting that you only get one free withdrawal per month. There is no minimum withdrawal amount. Additional withdrawals each month incur a fee and this is generally around $15 per transaction for electronic funds transfer and $25 for checks and bank wires. Withdrawals back to credit cards are no longer supported. Support is a little disappointing. You can only contact the Pinnacle customer support team via email. There is no live chat and no telephone support available. The site does have a FAQs section that you can go through before sending a message to the support team. It should be noted that the support team is very fast, helpful and friendly. Overall, Pinnacle Sports offers a good range of sports and excellent football coverage. They have great prices and they do offer bonuses and promotions on a regular basis. Even without a welcome bonus, Pinnacle is an excellent sports betting site and if you are serious about betting on sporting events this site is hard to beat. You can place wagers on soccer, tennis, Aussie Rules, baseball, basketball, boxing, chess, cricket, eSports, football, golf, mixed martial arts, rugby league, rugby union, soccer, and even table tennis. There are plenty specials too including eSports and politics. Even though you won't find a welcome bonus at Pinnacle Sports, you'll have the edge with some of the lowest margins and bets odds in the industry. You will also appreciate the user-interface and the wide variety of sports on offer. Visit our bookmaker review section for more information. Although Pinnacle does not offer a welcome bonus, it does feature some of the best odds and the lowest margins. It also comes equipped with a beautiful user-interface and tons of sports to bet on. Visit our sportsbook review section to find out more. Canadian bettors can look forward to the lowest margins and the best odds when registering with Pinnacle Sports. This incredible sports betting brand is the only bookmaker that accepts arbitrage betting and offers over 1,000 betting-related articles. Visit our bookmaker review section for more info. Pinnacle is a renowned sports betting brand for Canadian punters boasting with an innovative user interface. Although it does not offer a welcome bonus, bettors will be treated to competitive odds on a wide variety of sporting events along with an array of payment methods and outstanding support. Pinnacle Sports is renonwed for its low margins and competitive odds. Join this legendary sports betting brand and bet on a variety of international sports, such as hockey, basketball, soccer, and more. Read our comprehensive review for additional information. Pinnacle Sports is renowned for low margins and the best odds in the industry. Register an account and place a bet on an array of sporting events, including hockey, basketball, baseball, and more. Visit our reviews section for more information on this incredible brand. Boasting the best odds with the lowest margins, you cannot go wrong with Pinnacle Sports. Bet on a wide selection of international sports, including baseball, basketball, football, hockey, and more. Read our detailed review on this sensational brand for more information. Pinnacle Sports is renowned for offering some of the best odds when it comes to betting on eSports. Register with the brand today and claim a mind-blowing welcome offer that every Canadian player will appreciate. Pinnacle is one of a few sportsbooks where bets on eSports tournaments are accepted. Join the bookmaker and enjoy a Canadian bonus that can be claimed on mobile and PC. Pinnacle Sports is offering the best odds ahead of the League of Legends World Championships on 20 September 2018. Place a bet on the outright winner between KINGZONE DragonX (+323), SK Telecom T1 (+517), or KT Rolster (+687) who are currently ranked as favourites to take the championship. The eSports NBA2K League is in full swing and Pinnacle Sports is offering some of the best odds in the industry. Place a bet on either the Raptors Uprising GC (+1359), Blazer5 Gaming (+386), or 76ers GC (+460) to win the league before August 17. Pinnacle Sports is an extremely popular sports betting site thanks to offering a vast selection of sports with truly competitive odds. The site also boasts with sensational promotions, a simplistic and modern website as well as a wide variety of popular payment methods. With over two decades of industry experience, Pinnacle Sports continues to grow in popularity among online sports bettors thanks to excellent odds on a broad range of sports. The site is also home to remarkable promotions, a wide variety of popular payment methods, a professional customer service centre, and a beautifully designed website. Established in 1998, Pinnacle Sports offers excellent odds on a wide variety of sports, including the best price for Asian handicaps in soccer and the best odds on NCAA and NFL football bets. The site also boasts with a wide range of payment methods and superior customer support. Pinnacle Sports provides competitive odds on a wide range of betting markets, and offers an array of sports betting articles to assist you in understand each betting type, regardless of the sport. The betting articles also allow you to gain an extra edge when making a bet on any sport. This site not only offers competitive odds on an array of different markets, but also provides a variety of betting articles that you can use to your advantage on the latest sporting events from around the world.